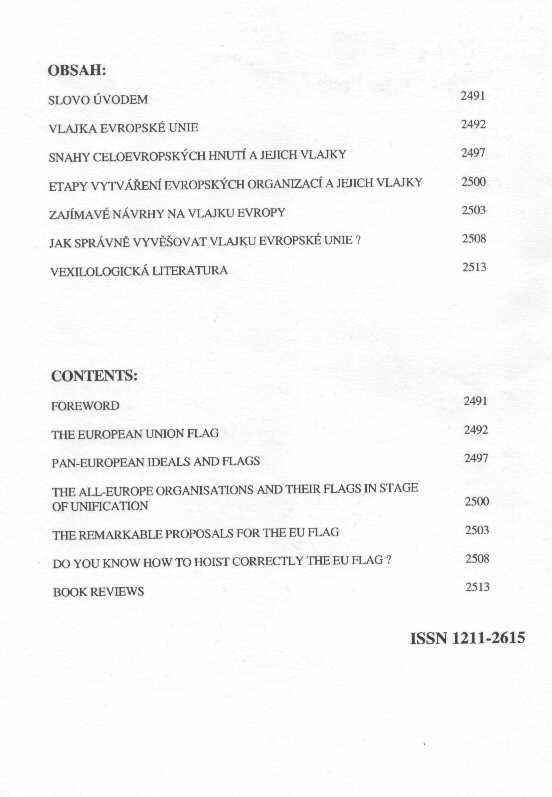 Referring to the fact that the Czech Republic is now entering the European Union, the Board of the Vexillological Club has decided to publish this special issue of VEXILOLOGIE on the subject of the European Union flag. To this end, a well-known Czech vexillologist, Jiří Tenora, has contributed five articles. These deal with the circumstances of the adoption of the EU flag, and the regulations for its use in combination with the national flag of Czechia and other member states of the Union. Also covered in other articles are projects for the “European flag” submitted to the design competition, together with earlier flags used by former Pan-European institutions, from the 1920’s onwards. The Board expresses its hope that this special issue of VEXILOLOGIE will meet a positive response from our readers.